Steve Lindsay was born in 1958 in Holdrege Nebraska. His father, Frank, is an accomplished jeweler, gemologist and watchmaker who worked with pride on precision watches and created custom jewelry, with Steve often at his side, learning the skills of gold and metalworking. 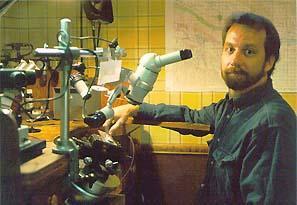 Steve's grandfather was a landscape painter, and his great-grandfather was also an engraver and jeweler. Steve, began learning the art of engraving at the age of twelve under his father's instruction. In 1975, he meet three friends of his father; John Rohner (founder of GRS tools and inventor of the worlds first pnematic power graver), Lynton McKenzie (recognized as one of the greatest gun engravers) and James Meek (author of "The Art of Engraving"). On the recommendation of John Rohner and James Meek he attended a tech college majoring in tool and die, mold making and mechanical engineering. After college Steve worked a short time in a tool room of a Nebraska manufacturing company. During off hours he made various engraving tools and vises and in 1981 began engraving full time. He has engraved for collectors and makers of knives, guns, watches and jewelry but for companies such as Oakley Sunglasses as well as production hand engraving and lettering for gold, silver and platinum instrument companies in New England. He also engraved in collaboration with engraver Lynton McKenzie on a Safari international rifle that auctioned by S.C.I. in 1986 selling for $201,000. Steve's engravings are cut by hand under a Zeiss microscope. The layout and designs of the engravings are first drawn with pencil and the design is then cut under the microscope with an AirGraver. 24k gold is used for inlays.